All ships participating in the Free Gaza flotilla, with several hundred peace activists and humanitarian aid on board, have been banned from leaving Greece’s ports. It comes after Israel pledged to keep the flotilla away from the Gaza Strip’s shores. 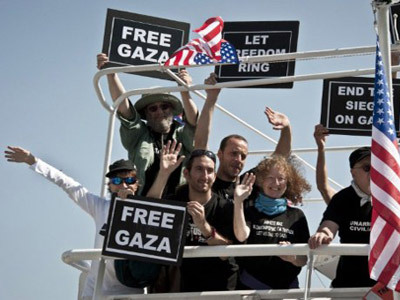 ­The organizers of the multinational Freedom Flotilla II were planning to defy the Israeli authorities and deliver humanitarian aid to the blockaded Palestinian territory. The vessels were designed to replicate the first Freedom Flotilla, which tried to break the Gaza blockade in May 2010, when Israel ended the attempt, having stormed the lead vessel and killed nine Turkish activists, sparking a diplomatic storm. 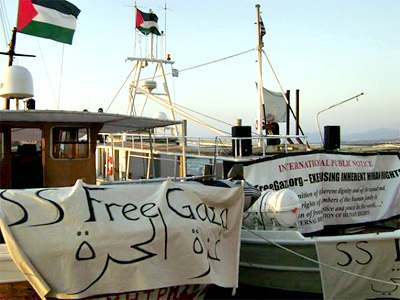 There are ten ships and about 300 activists from 22 countries participating in this year’s Freedom Flotilla. Activists say that while they do not have any illusions that they will be allowed by the Israelis to reach Gaza, they are merely attempting to bring attention to the situation. According to Greek authorities some of the activists have already been arrested and are in jail. They say the 60-year-old captain of the “Audacity of Hope” will remain in custody until Thursday’s court hearing. He is facing charges of endangering the lives of the 36 passengers of his boat in his attempt to sail away from the port of Perama without authorities’ permission. 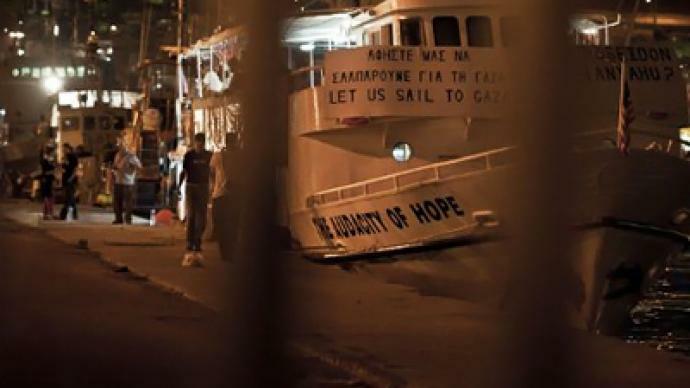 Reportedly some activist groups are planning a number of large demonstrations in Athens to call on the Greek government to give a legitimate explanation as to why it is preventing these ships from sailing. International critics say that Greek government has no right to prevent ships from leaving its ports depending on where they plan to sail. The only thing a country can legally do is prevent ships from docking at its ports. Adam Shapiro, an American activist on board a ship taking part in Freedom Flotilla II, says the Greek government was under pressure from Israel and the US. “One of the boats, the US boat, tried to make its way out into international waters where it was due to meet with the other ships. 15-20 minutes out towards open waters the Greek coastal guards came up, stopped the ship from in front with a couple of larger coastguard cutters." “Coastguard commandos were wearing masks and carrying automatic guns… threatening to use tear gas, threatening to board the ship. Openly, the captain was threatened with arrest. And the ship was escorted back into the port,” Shapiro told RT, giving his account of how the flotilla was stopped, before it had even started. “We still have seven other ships that are in port ready to leave and two of our ships earlier this week have been sabotaged,” he went on. “Israel is already attacking the flotilla. And we know, we saw, we heard Prime Minister Netanyahu’s comment where he thanked Greek Prime Minister Papandreou for basically doing Israel’s work for it." “And what we know behind the scenes is that Israel has been putting, as well as the United States have been putting, a ton of pressure on the Greek government,” Shapiro said. Flotilla activists called on Greece to resist Israel's diplomatic pressure. Israel has already claimed an international aid flotilla is carrying chemical weapons which could be used on soldiers attempting to stop it reaching Gaza. 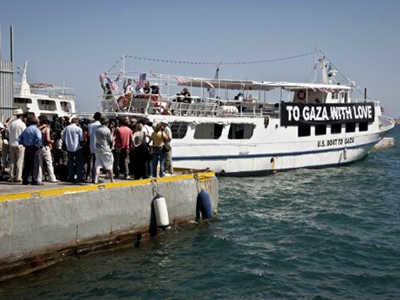 Peace activists called the claims propaganda, arguing the vessels posed no threats for Israel. Earlier, the Israeli government ordered the country’s Defense Ministry to block any attempts to deliver humanitarian aid to Palestinian territory, acting maximally firm but avoiding bloodshed. At the same time, Israel’s Ministry of Foreign Affairs got an order to pursue with diplomatic efforts to prevent a possible breach of its naval blockade of the Palestinian territory. Why is the flotilla heading for Gaza to break the blockade?